RIT brought together data science experts to discuss the future of midsized smart cities at the second annual International Workshop on Urban Data Science this July in Thailand. Rochester Institute of Technology is making sure that mega cities aren’t the only ones using “smart” technology. 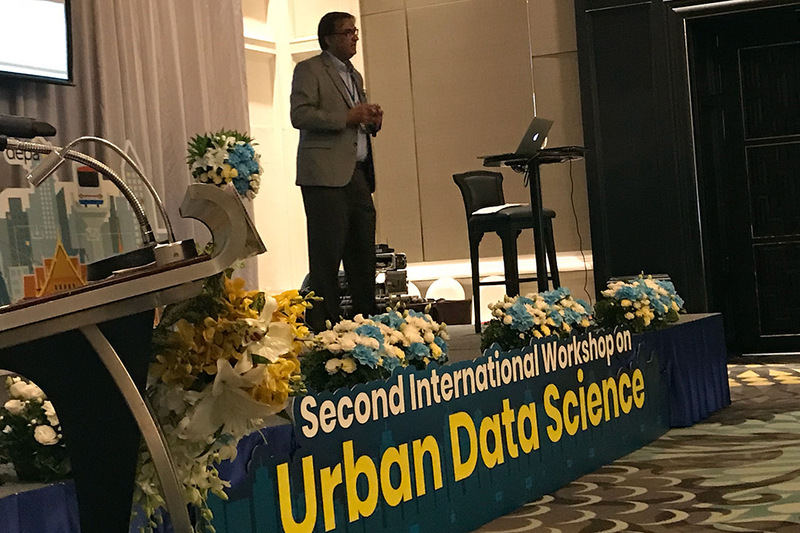 As part of RIT’s Urban Data Science initiative, 100 researchers and practitioners from around the world came together to discuss the future of smart cities at the International Workshop on Urban Data Science in Bangkok. The second annual workshop, held in July, focused on how the next phase of data science can help cities in developing countries and midsized cities, including Rochester, N.Y.
Urban data science is essentially a tool that city planners can use to make informed decisions. Data collected through Internet of Things (IoT) technology, artificial intelligence, machine learning and social media can be used to improve traffic flow, monitor crime activity, track water consumption, promote public health and more. RIT created the Urban Data Science initiative and workshop in 2017 to bring together a multidisciplinary group from academia, industry and city administration who are exploring these issues. The first workshop, held at RIT, allowed experts in data science, social sciences, cloud and distributed computing, urban sustainability, public policy and software engineering to present new findings, discuss current and future urban challenges, exchange ideas and discuss potential collaborative opportunities. The second workshop, held in Bangkok, allowed an even larger international group to attend. Experts came from IBM, Verizon, Rutgers University, Penn State, Louisiana Tech University Indian Institute of Technology Madras and the Indian and Thai governments. Keynote speakers at the workshop included Avik Sarkar, head of data analytics at National Institution for Transforming India (NITI) Aayog; Lim Hock Beng, program director of the Intelligent System Center at Nanyang Technological University in Singapore; and Dennis Ong, distinguished architect and managing principal at Verizon Technical. The workshop emphasized how urban data science can improve mid-size cities, such as Rochester, which have significantly fewer resources and whose problems may be fundamentally different compared to those of megacities. Sharma also pointed out that there are a lot more midsized cities than cities like Singapore. For RIT, research in urban data science will allow students and faculty to build technology that has a real impact on the lives of citizens. Sharma is currently working with an RIT Ph.D. student to create technology that recommends vacant lots for conversion into a community garden or public space. The tool uses traffic, crime and other data to determine which lots might affect the greatest change. RIT student researchers are also working to lower barriers to access this technology, making it easier for city leaders and city youth to get engaged with urban data science. Ph.D. students are creating a citizen-centric user interface that allows anyone to build custom apps that use data science. The Urban Data Science initiative is interdisciplinary, working with Ann Howard, a professor in RIT’s College of Liberal Arts, and other faculty and students from the B. Thomas Golisano College of Computing and Information Sciences. For more information about the annual workshop, go to urban.se.rit.edu.